Our own Frances Wood has completed an In-Depth Training Program with Leading Tour and Cruise Company, Tauck. NORWALK, CT (August 2015) Frances Wood, a travel agent from Reid Travel in Boca Raton, FL, recently completed an in-depth training program with Tauck, thus joining less than 1% of the company's worldwide network of travel agents who have successfully completed the program. 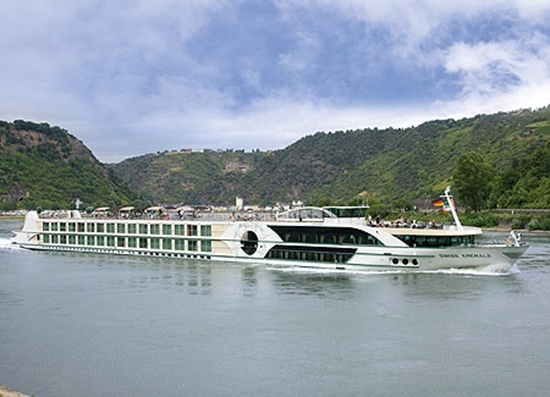 Tauck is a 90-year-old leader in premium quality guided travel, with over 120 land journeys and cruises to more than 70 countries and all seven continents. The company has been named the "World's Best River Cruise Line" three times by the readers of Travel + Leisure magazine, and Tauck has also been on the magazine's list of the "World's Best Tour Operators" in each of the past 18 years. Frances was enrolled in the company's agent training program Tauck Academy, and by successfully completing its curriculum, she becomes a Tauck Certified agent who qualifies for special benefits and other exclusive opportunities provided by the company. Tauck Academy includes nine hours of intensive classroom training followed by a comprehensive exam. Topics covered include Tauck's history, details of the company's extensive product line, and what separates Tauck's tours and cruises from those of its competitors. Congratulations Frances, job well done! If Israel is still on your bucket list as a must-see destination... now is the perfect time to make it happen because here at Reid Travel, we are featuring a marvelous 10-day Mediterranean cruise aboard Silversea's Silver Spirit to take you there in style. You can do it this year if you hurry, and there is a "Same Time Next Year" opportunity as well. Your friendly blogger, Helene Golden, has the pleasure of being the Signature hostess on this year's sailing on the Silver Spirit on October 16th and is so looking forward to cruising with our Signature clientele. (We can still book it for you if you hurry!) The 2016 sailing is on October 24th on the Silver Cloud. 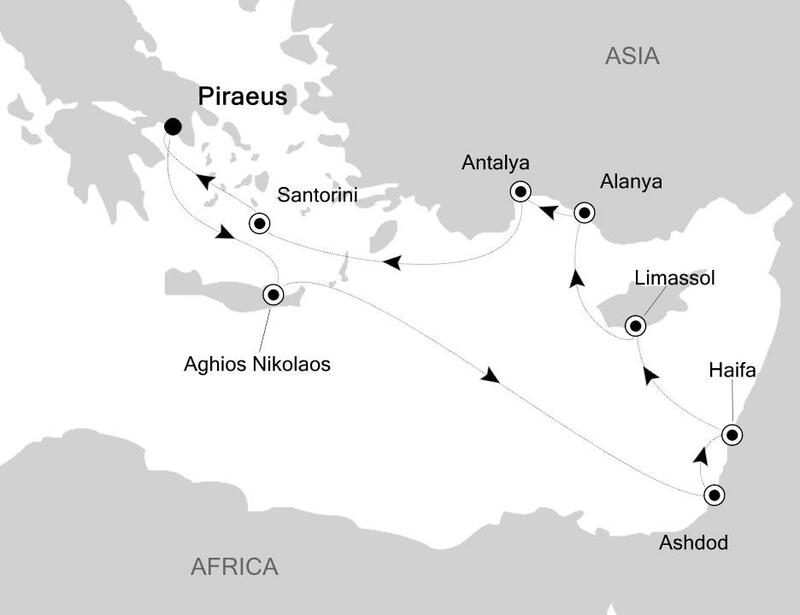 Both sailings begin and end in Athens and include lovely destinations in the Greek Isles, Cyprus and Turkey. Israel, a thin slice of land, 500 kilometers long by 140 kilometers wide, has a fascinating variety of landscapes, climates and history. Small, yes; but there is so much to see and do - you can experience its extraordinary history as well as its modern treasures on this cruise. Adding to the appeal is its distinction of being the home of three major religions: Judaism, Christianity and Islam. From the port of Ashdod, you can tour Jerusalem or Tel Aviv and Jaffa. Jerusalem's Old City - added to the UNESCO World Heritage Site List in 1981--is home to several sites of key religious importance: The Dome of the Rock, al-Aqsa Mosque for Muslims, the Temple Mount and Western Wall for Jews and the Church of the Holy Sepulchre for Christians. Visit Tel Aviv and its Bauhaus-style modernist buildings; the Carmel Market (the largest open-air market) and practice your bargaining skills; watch the sunset over the Mediterranean while sipping your favorite drink at a seaside cafe. 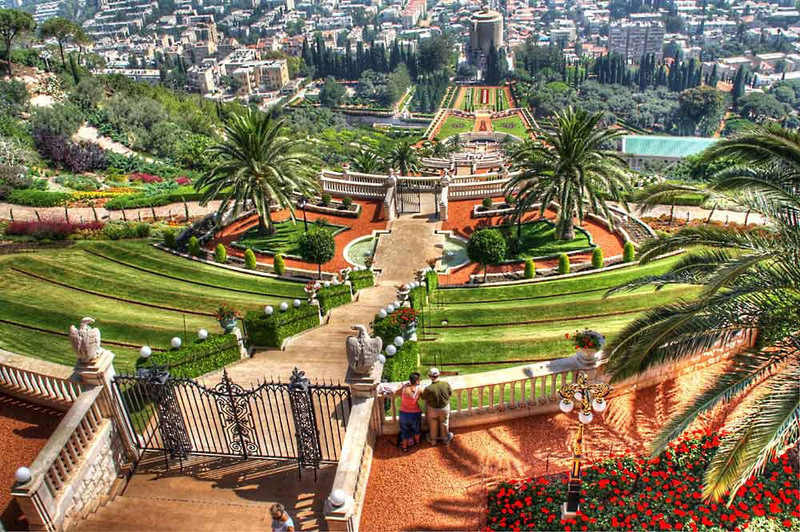 Marvel over Haifa's Bahai Gardens located in the heart of Haifa (a UNESCO site). These magical terraces must be one of the most beautiful gardens in the world. Try to imagine a staircase of nineteen terraces extending all the way up the northern slope of Mount Carmel. Visit Safed in the upper Galilee, one of the holy Jewish cities which provides some bewitching views of the Golan. The archaeological site of Capernaum is where Jesus lived, preached, and gathered the first of his disciples. The beautiful remains of a fourth-century synagogue are the most prominent ruins here, while the modern church on the site is built over the remnants of a Byzantine church and the ruins of the House of St. Peter. Santorini, an island in the southern Aegean Sea that is so spectacular it defies description. With our invaluable advice and unrivaled resources our Reid Travel advisors will insure that you get the most for your vacation dollar...hassle free! Well, our Julia has been back from her polar adventure on Silverseas Silver Explorer for some time now. 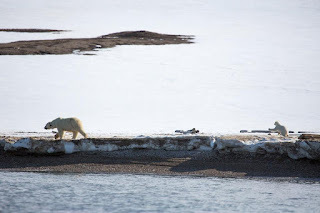 So, as promised in our June 19th post, we are sharing Julia's "cool" summer adventure in the Arctic, where the cruise season runs from May through September for obvious reasons. (BTW there's still time to get onboard this season if you call right away.) But if you can't make it now, this is the time to book for 2016. First a little info about the geography. The Arctic is really "The Top Of The World" and includes many countries, including parts of Canada, Greenland, Iceland, Norway, and Russia. Although some cruises depart from capital cities, most leave from cities in Norway. Julia's cruise departed from Tromso--the second largest city north of the Arctic Circle--going north to Longyearben, land of the "midnight sun". There, from May through July, the day never ends and between November and January the sun doesn't shine, and early spring is a good time to witness the Northern Lights known as the Aurora Borealis. Mom and cub for Julia's special birthday! Julia was celebrating a special birthday on this adventure and her most wished-for gift was the sight of a polar bear and its cub. Well Julia is blessed in many ways; she got her wish on her birthday, June 19th, the eighth day of the cruise. 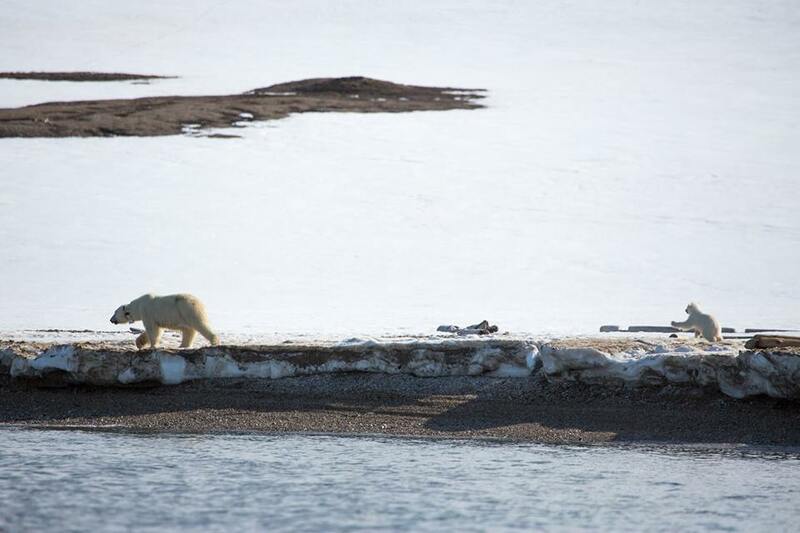 For more than two hours she and her fellow cruisers watched the cub roll in the snow, walk away and then turn around and run after mom, even take a swim with mom and come out of the water on mom's back. A special wish granted! Her days (and nights) on the Silver Explorer expedition ship were quite different from a classic cruise. Expedition ships don't feature casinos, multiple restaurants, cruise directors or shows. Instead you will find an expedition leader, naturalists, lectures and daily zodiac expeditions. Still, the Silversea traditions were very evident on this cruise and all the experiences were well planned. A rotation system was set up to insure that everyone could start early and/or sleep late and only a certain number of people would be ashore at any given time. Each expedition lasts about 90 minutes, and each zodiac carries 8 to 10 people including the naturalist who navigates the zodiac. Sorkapp, the bear territory--didn't see any bears, but the ice cruising was enjoyed by everyone. Gnalodden, which is best known for its bird cliffs and trapper's hut. The story was told of Wanny Wolstad, a woman from Norway who spent five years living in the trapper's hut. Julia wondered how she managed to sleep through the cacophony of thousands of humming birds. Maybe it was just the scenery that made the noise bearable. Julia's days -- remember no darkness--were filled with briefings and lectures which ended in time for a 7:30pm dinner. She never knew what magnificent sight would appear at any particular time. Something unexpected was always expected making the cruise a really memorable adventure. Julia wrote about it in her blog. So you can click here to join Julia and enjoy her full report being at the top of the world. We hope that our blog is a fun way of helping you prepare for a memorable journey of your own. Our Reid Travel advisors really enjoy mixing their knowledge with your imagination to concoct the perfect mix of travel and adventure tailored to your travel desires.